The index opened flat to negative and stayed in a narrow range of 43 points to close flat at 7935.25, small loss of 7.45 points. The broader market was positive, with 915 advances to 623 declines. The range at the start of series stays at 7500-8300. Call option 8000-8500 added huge 13.87 lacs OI with short covering seen at 7900 and below strike prices. 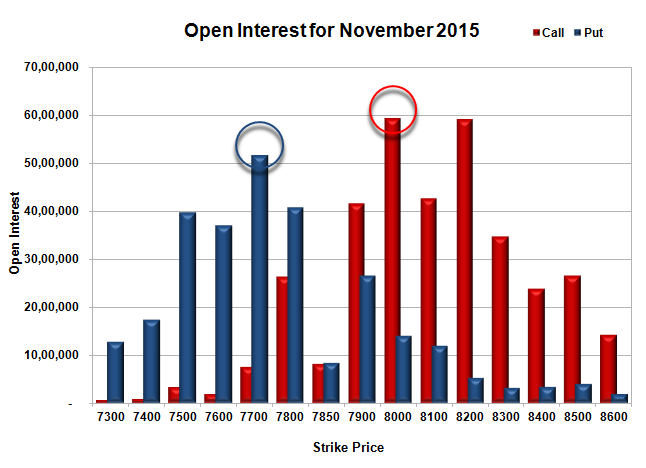 Put option 8000-7400 added huge 10.85 lacs OI with short covering seen at 8200 and above strike prices. 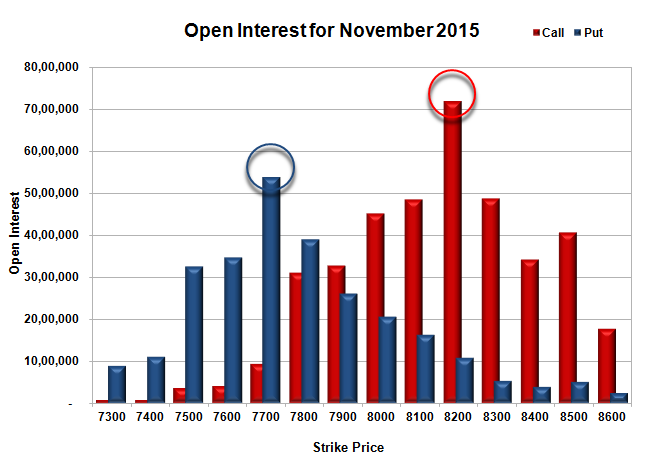 Nifty Open Interest is at 1,92,02,025 up by 4,74,975, with no change in price, most probably short/long build-up. Bank Nifty Open Interest is at 19,20,660 down by 53,190, with increase price, most probably short covering. FII’s bought 3.11 lacs Futures, which includes net 7545 contracts long build-up and 4909 contracts short covering, with increase in net OI by 2636 contracts, includes 36754 longs to 24300 shorts for the day. FII’s Index future open contract as on date is 139687 Longs to 117866 Shorts, Net Long 21821 up by 12454 contracts. 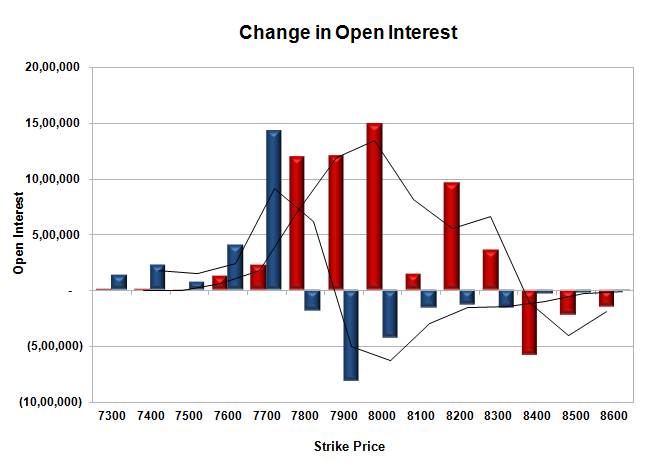 Initial support stays at 7900, with OI of 27.40 lacs and below that at 7500 with OI of 47.91 lacs. Initial resistance at 8000, with OI of 37.03 lacs and above that at 8300 with OI of 35.87 lacs. Day Range as per Option Table is 7882 - 7999 and as per VIX is 7867 - 8003 with 7941 as the Pivot. The index opened positive above 7910 and stayed positive throughout the entire session of trade to close near the highs at 7942.70, gain of 58.90 points. The broader market was positive, with 795 advances to 733 declines. The range at the start of series stays at 7500-8300. Call option 7900-8600 added huge 23.13 lacs OI with short covering seen at 7800 and below strike prices. Put option 8300-7300 added huge 43.63 lacs OI. 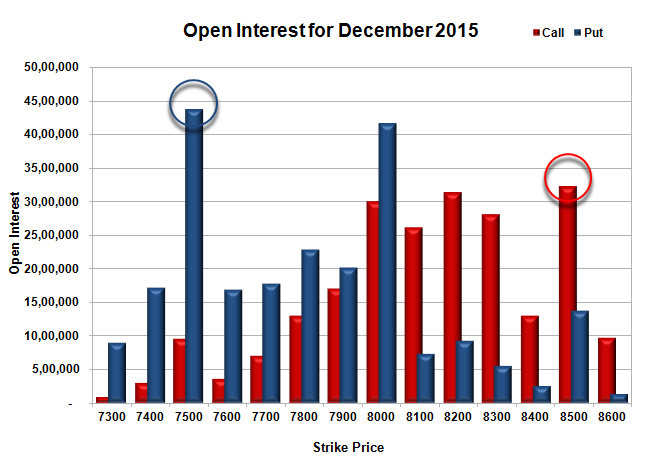 Nifty Open Interest is at 1,87,27,050 down by 50,850, with increase in price, most probably small short covering. 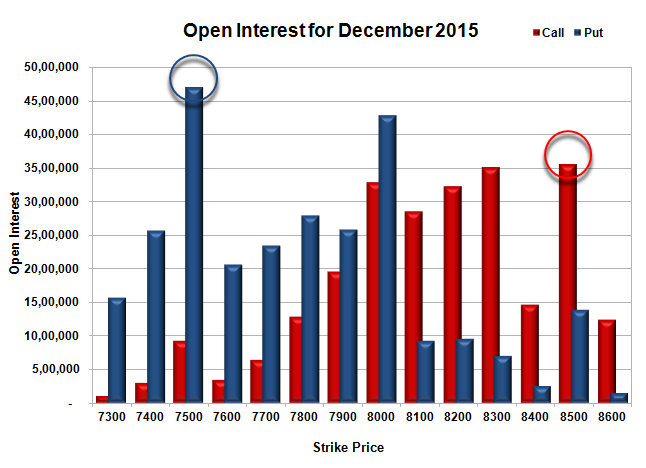 Bank Nifty Open Interest is at 19,73,850 up by 1,84,050, with increase price, most probably huge long build-up. FII’s bought 1.37 lacs Futures, which includes net 4058 contracts long build-up and 1441 contracts short covering, with increase in net OI by 2617 contracts, includes 28173 longs to 22674 shorts for the day. FII’s Index future open contract as on date is 132142 Longs to 122775 Shorts, Net Long 9367 up by 5499 contracts. Initial support now at 7900, with OI of 25.81 lacs and below that at 7500 with OI of 46.99 lacs. Initial resistance at 8000, with OI of 32.89 lacs and above that at 8300 with OI of 35.09 lacs. Day Range as per Option Table is 7869 - 7995 and as per VIX is 7873 - 8012 with 7927 as the Pivot. The index opened flat to positive and stayed positive throughout the entire session of expiry trade and closed near the highs at 7883.80, gain of 52.20 points. The broader market was positive, with 928 advances to 597 declines. The range at the start of series is 7500-8300. Call option 7900-8600 added 39.59 lacs OI. Put option 8500-7300 added 39.05 lacs OI. Nifty Open Interest is at 1,87,77,900 up by 47,10,525, with increase in price, most probably 100% roll-over with huge long build-up. 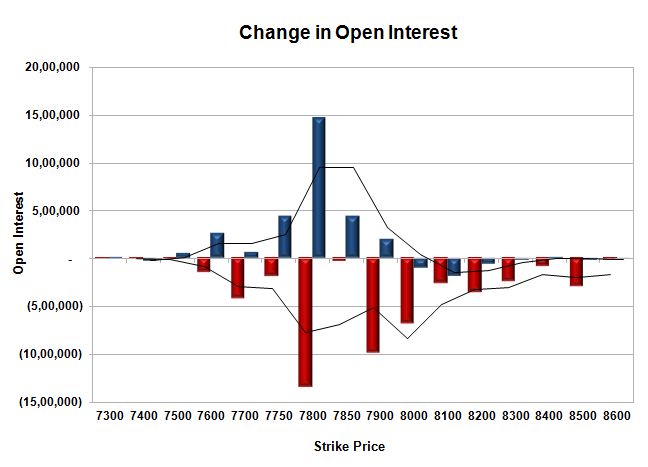 Bank Nifty Open Interest is at 17,89,800 up by 6,50,430, with increase price, mostly roll-over with small short covering. FII’s sold 1.41 lacs Futures, which includes net 87286 contracts long liquidation and 78604 contracts short covering, with decrease in net OI by 165890 contracts, includes 63308 longs to 68944 shorts for the day. FII’s Index future open contract as on date is 128084 Longs to 124216 Shorts, Net Long 3868 down by 8682 contracts. 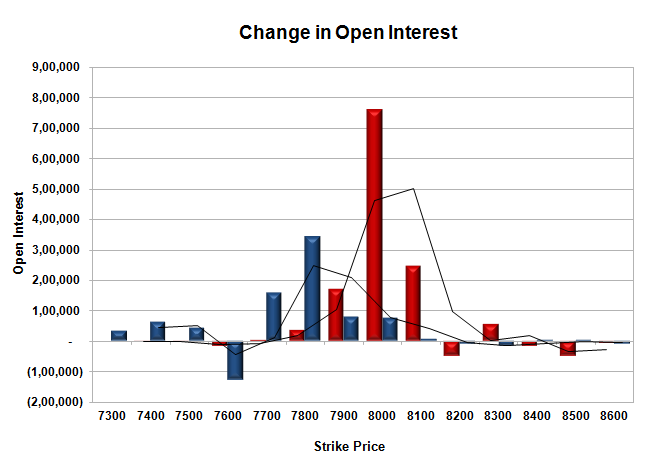 Initial support at 7800, with OI of 22.81 lacs and below that at 7500 with OI of 43.77 lacs. Initial resistance at 8000, with OI of 30.00 lacs and above that at 8200 with OI of 31.44 lacs. 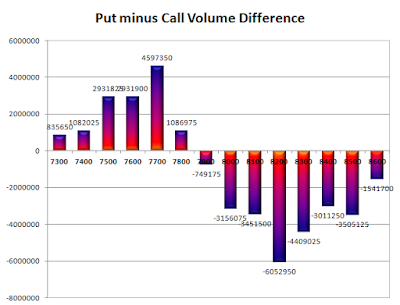 Day Range as per Option Table is 7812 - 7939 and as per VIX is 7815 - 7953 with 7871 as the Pivot. The index opened flat to negative and stayed in a narrow range for the second day in a row but closed weak around the lows of the day at 7831.60, loss of 17.65 points. The broader market though was positive, with 847 advances to 678 declines. The range for expiry is 7800-7900. Call option 7850-7900 added 8.37 lacs OI with profit booking seen at 8000 and above strike prices. Put option 7850-7800 added 9.85 lacs OI with profit booking seen at 7700 and below strike prices. Nifty Open Interest is at 1,18,00,800 down by 19,71,300, whereas Dec series added 35.17 lacs with decrease in price, most probably 100% roll-over with huge short build-up. Bank Nifty Open Interest is at 13,99,440 down by 4,03,770, whereas Dec series added 3.76 lacs with decrease price, mostly roll-over with small long liquidation. FII’s sold 0.61 lacs Futures, which includes net 17208 contracts long build-up and 19633 contracts short build-up, with increase in net OI by 36841 contracts, includes 115734 longs to 118159 shorts for the day. FII’s Index future open contract as on date is 215370 Longs to 202820 Shorts, Net Long 12550 down by 2425 contracts. Initial and best support at 7800, with OI of 47.58 lacs and below that at 7700 with OI of 39.83 lacs. Initial and very good resistance at 7900, with OI of 51.87 lacs and above that at 8000 with highest OI of 59.24 lacs. Day Range as per Option Table is 7772 - 7900 and as per VIX is 7765 - 7898 with 7838 as the Pivot. The index opened flat and stayed in a narrow range of 52 points for the entire session of trade and closed flat at 7849.25, loss of 7.30 points. The broader market was positive, with 831 advances to 705 declines. The range till expiry stays at 7700-8000. Call option 7850-8000 added huge 15.74 lacs OI with profit booking seen at 8200 and above strike prices. 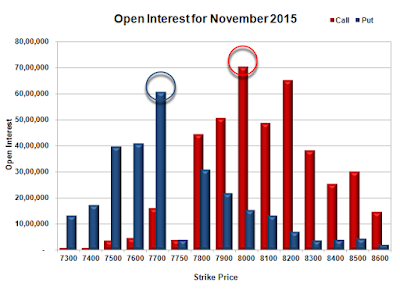 Put option 7850-7800 added 3.32 lacs OI with short covering seen at 7900 and above strike prices. Nifty Open Interest is at 1,37,72,100 down by 20,15,025, whereas Dec series added 45.63 lacs with not much change in price, most probably 100% roll-over with long/short build-up. Bank Nifty Open Interest is at 18,03,210 down by 3,79,080, whereas Dec series added 4.55 lacs with no change in price, most probably 100% roll-over long/short build-up. 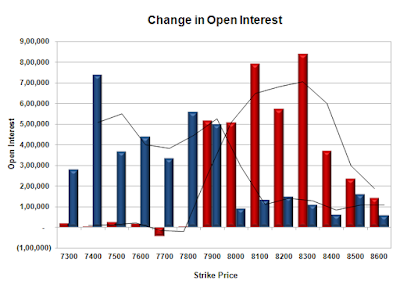 FII’s bought 1.67 lacs Futures, which includes net 38902 contracts long build-up and 32235 contracts short build-up, with increase in net OI by 71137 contracts, includes 126733 longs to 120066 shorts for the day. FII’s Index future open contract as on date is 198162 Longs to 183187 Shorts, Net Long 14975 up by 6667 contracts. 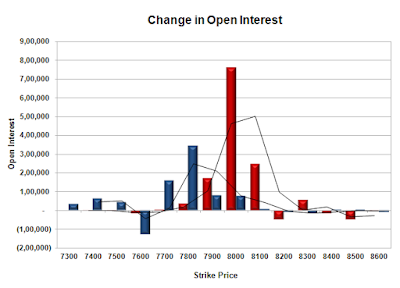 Initial support at 7800, with OI of 42.45 lacs and below that at 7700 with OI of 48.71 lacs. Initial and very good resistance at 7900, with OI of 48.43 lacs and above that at 8000 with highest OI of 65.65 lacs. Day Range as per Option Table is 7782 - 7918 and as per VIX is 7779 - 7919 with 7851 as the Pivot. The index opened flat and after an initial dip saw huge buying interest to move above 7900, but saw the sellers back in action to close flat at 7856.55, gain of 13.80 points. The broader market though was positive, with 893 advances to 635 declines. The range for the series stays at 7700-8000. Call option 7850-7900 added 1.10 lacs OI with short covering seen at 7800 and below strike prices. Put option 7900-7850 added 5.25 lacs OI with profit booking seen at 7800 and below strike prices. Nifty Open Interest is at 1,57,87,125 down by 8,92,350, whereas Dec series added 12.00 lacs with not much change in price, most probably 100% roll-over with long/short build-up. Bank Nifty Open Interest is at 21,82,290 down by 94,590, whereas Dec series added 1.07 lacs with decrease in price, most probably 100% roll-over small short build-up. 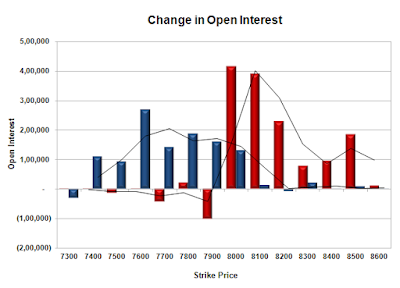 FII’s bought 1.22 lacs Futures, which includes net 10370 contracts long build-up and 5478 contracts short build-up, with increase in net OI by 15848 contracts, includes 56086 longs to 51194 shorts for the day. 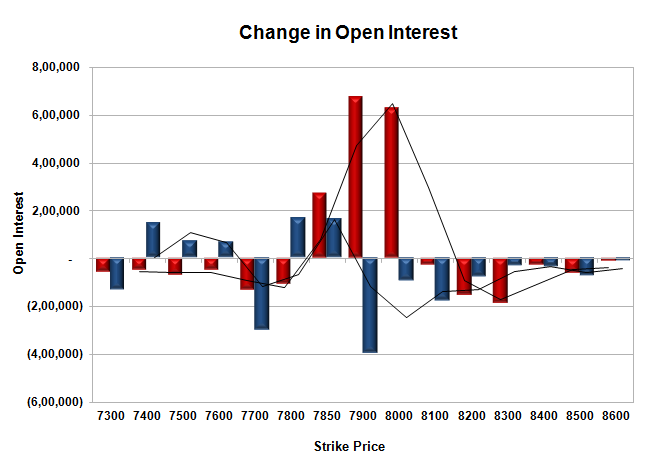 FII’s Index future open contract as on date is 159260 Longs to 150952 Shorts, Net Long 8308 up by 4892 contracts. 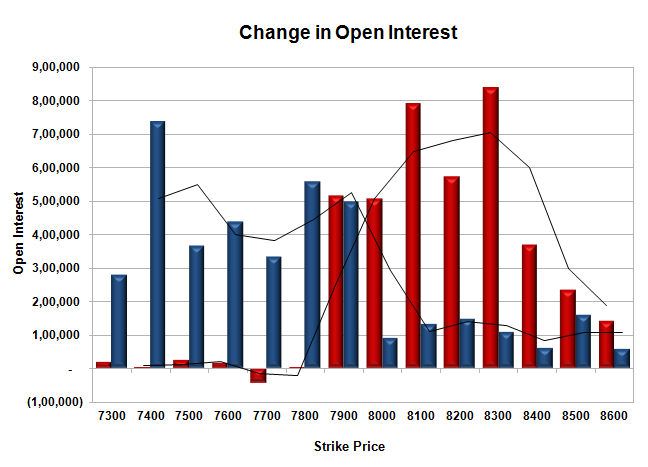 Initial support at 7800, with OI of 40.75 lacs and below that at 7700 with OI of 51.71 lacs. Initial resistance stays at 7900, with OI of 41.68 lacs and above that at 8000 with highest OI of 59.38 lacs. Day Range as per Option Table is 7786 - 7933 and as per VIX is 7791 - 7922 with 7860 as the Pivot. The index opened up around 7788 and went on to scale back 7800 with ease and closed near the highs of the day at 7842.75, huge gain of 110.95 points. The broader market was strong, with 1078 advances to 433 declines. The range for the series stays at 7700-8000. 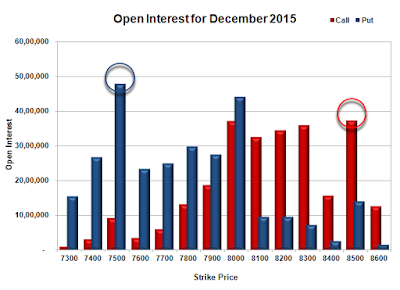 Call option added nil OI with short covering seen at 7800 and below strike prices. 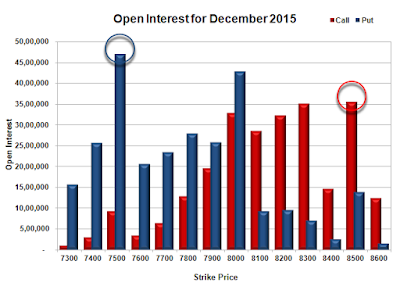 Put option 7900-7500 added huge 29.30 lacs OI with short covering seen at 8000 and above strike prices. Nifty Open Interest is at 1,66,79,475 down by 9,69,450, whereas Dec series added 2.94 lacs with increase in price, most probably huge short covering with some roll-over. Bank Nifty Open Interest is at 22,76,880 down by 3,07,290, whereas Dec series added just 0.37 lacs with increase in price, most probably huge short covering with small roll-over. FII’s bought 0.16 lacs Futures, which includes net 277 contracts long liquidation and 935 contracts short covering, with decrease in net OI by 1212 contracts, includes 43397 longs to 42739 shorts for the day. FII’s Index future open contract as on date is 148890 Longs to 145474 Shorts, Net Long 3416 up by 658 contracts. 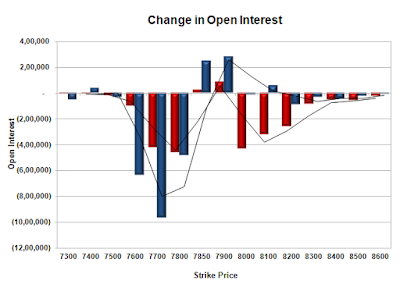 Initial support back at 7800, with OI of 45.58 lacs and below that at 7700 with OI of 61.36 lacs. 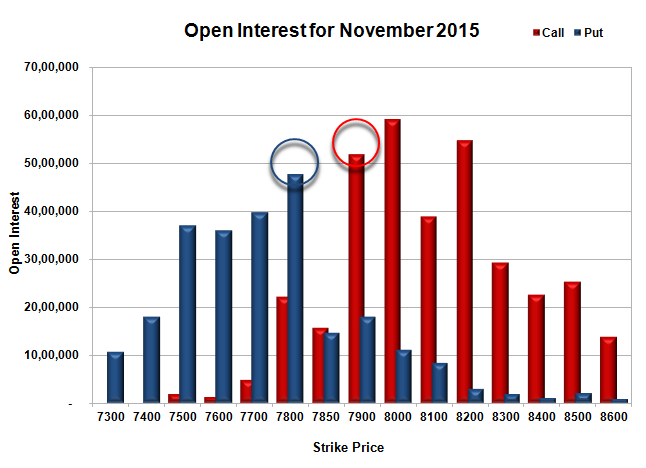 Initial resistance at 7900, with OI of 40.83 lacs and above that at 8000 with highest OI of 63.69 lacs. 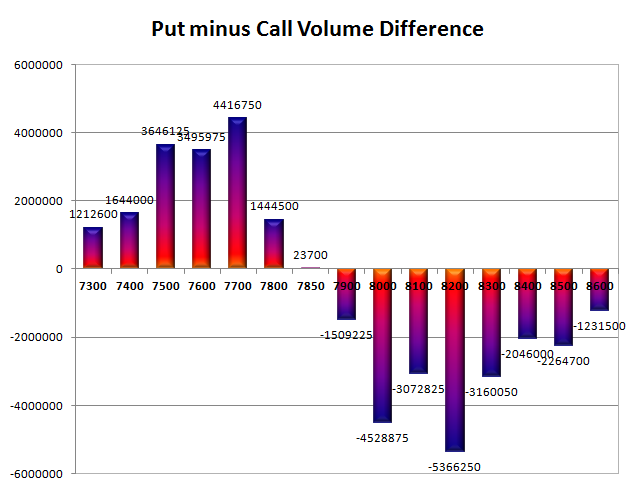 Day Range as per Option Table is 7751 - 7901 and as per VIX is 7778 - 7908 with 7821 as the Pivot. The index opened flat to negative and after staying within a narrow range saw huge breakdown to close near the lows of the day at 7731.80, huge loss of 105.75 points. The broader market was weak, with 516 advances to 1012 declines. The range for the series stays at 7700-8000. Call option 7700-8000 added 32.79 lacs OI with profit booking seen at 8100 and above strike prices. Put option 7700-7300 added huge 19.63 lacs OI with short covering seen at 7800 and above strike prices. 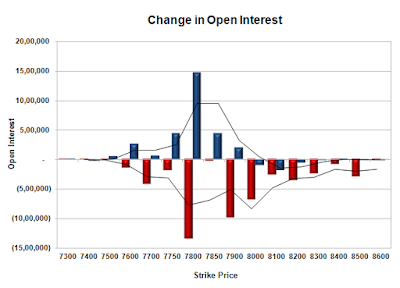 Nifty Open Interest is at 1,76,48,925 up by 6,52,500, whereas Dec series added 3.07 lacs with decrease in price, most probably huge short build-up in both series. Bank Nifty Open Interest is at 25,84,170 up by 1,25,670, whereas Dec series added 0.54 lacs with decrease in price, most probably huge short build-up. 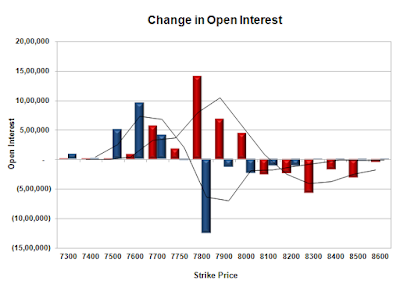 FII’s bought 0.72 lacs Futures, which includes net 7792 contracts long build-up and 4911 contracts short build-up, with increase in net OI by 12703 contracts, includes 31212 longs to 28331 shorts for the day. FII’s Index future open contract as on date is 149167 Longs to 146409 Shorts, Net Long 2758 up by 2881 contracts. Initial and best support at 7700, with OI of 60.74 lacs. 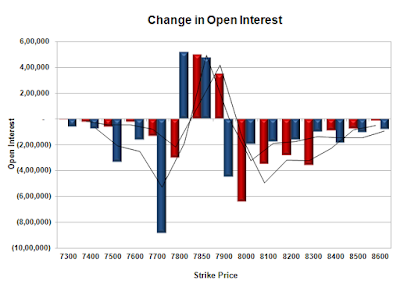 Initial resistance at 7800, with OI of 44.37 lacs and above that at 7900 with OI of 50.70 lacs. 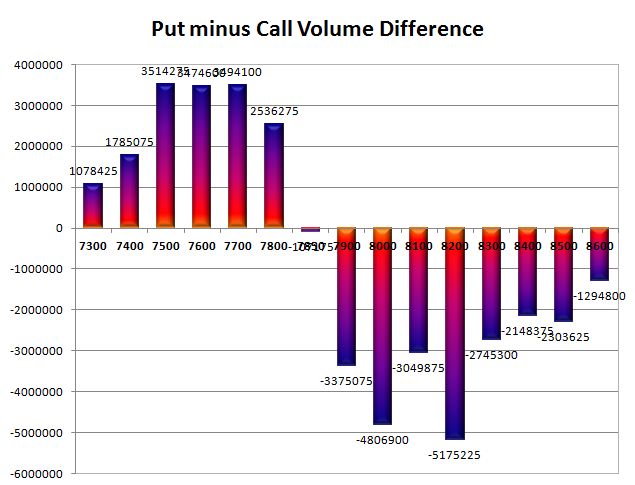 Day Range as per Option Table is 7687 - 7831 and as per VIX is 7661 - 7802 with 7767 as the Pivot. The index opened strong around 7849 but saw profit booking towards the lows at 7793, but responsive buying saw Nifty close positive at 7837.55, gain of 30.95 points. The broader market was positive, with 821 advances to 702 declines. The range for the series stays at 7700-8000. 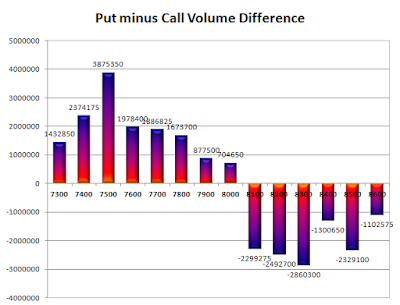 Call option 7900-8100 added 2.86 lacs OI with profit booking seen at 8200 and above strike prices. Put option 7900-7800 added 6.16 lacs OI with profit booking seen at 7700 and below strike prices. Nifty Open Interest is at 1,69,96,425 down by 1,56,000, with increase in price, most probably short covering. Bank Nifty Open Interest is at 24,58,500 up by 3,600, with increase in price, most probably short covering. FII’s sold 0.52 lacs Futures, which includes net 2056 contracts long liquidation and 5 contracts short build-up, with decrease in net OI by 2051 contracts, includes 27457 longs to 29518 shorts for the day. FII’s Index future open contract as on date is 141375 Longs to 141498 Shorts, Net Short 123 down by 2061 contracts. 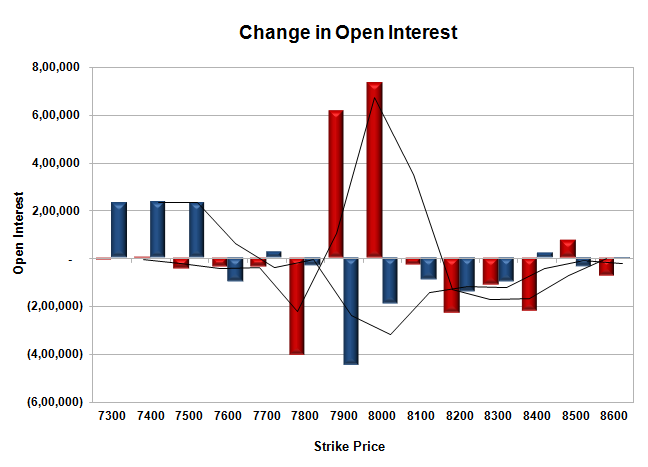 Initial support at 7800, with OI of 43.46 lacs and below that at 7700 with OI of 56.65 lacs. Initial resistance at 7900, with OI of 43.83 lacs and above that at 8000 with OI of 66.13 lacs. Day Range as per Option Table is 7762 - 7902 and as per VIX is 7768 - 7907 with 7830 as the Pivot. The opened weak and stayed weak albeit in a narrow range and closed at the lowest point of the series at 7762.25, loss of 62.75 points. The broader market was also weak, with 454 advances to 1076 declines. The range for the series stays at 7700-8200. 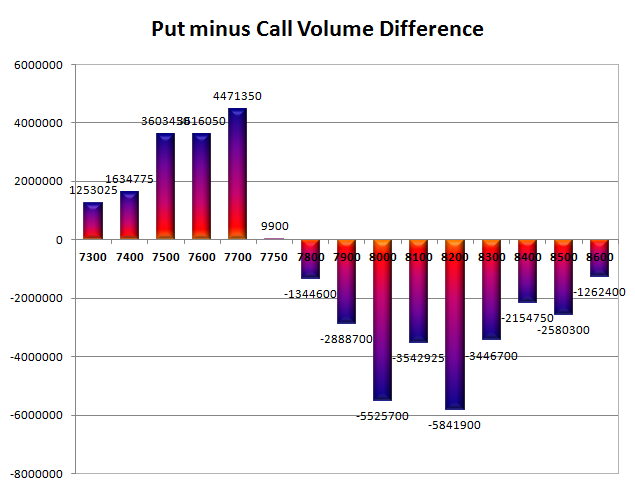 Call option 7500-8200 added huge 16.55 lacs OI with profit booking seen at 8300 and above strike prices. Put option 7700-7300 added 5.56 lacs OI with short covering seen at 7800 and above strike prices. 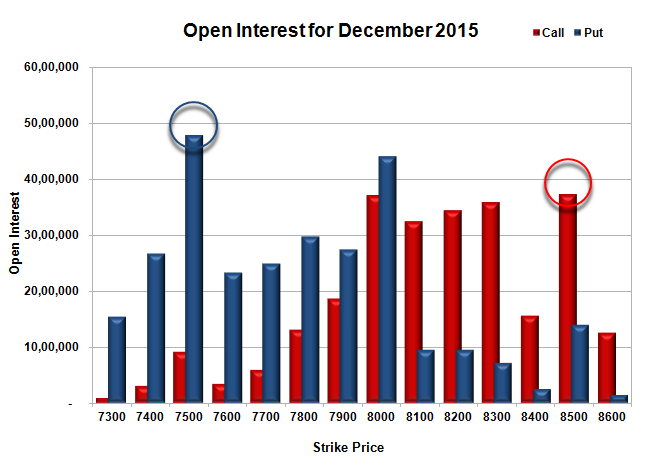 Nifty Open Interest is at 1,75,51,350 down by 81,975, with decrease in price, most probably long liquidation. 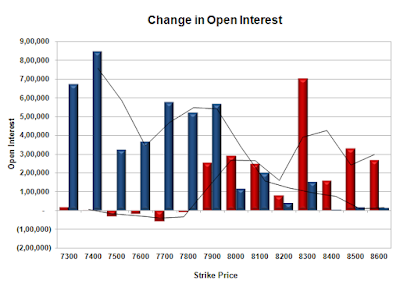 Bank Nifty Open Interest is at 24,23,880 down by 11,040, with decrease in price, most probably long liquidation. FII’s sold 5.50 lacs Futures, which includes net 10090 contracts long liquidation and 11901 contracts short build-up, with increase in net OI by 1811 contracts, includes 20119 longs to 42110 shorts for the day. 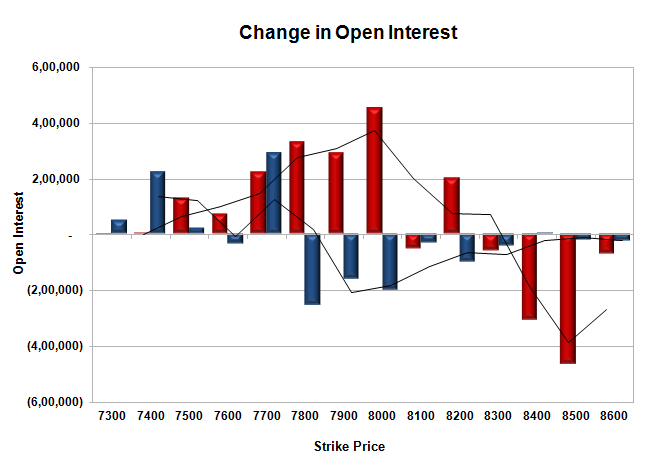 FII’s Index future open contract as on date is 148726 Longs to 135853 Shorts, Net Long 12873 down by 21991 contracts. Initial and best support at 7700, with OI of 58.33 lacs. Initial resistance at 7800, with OI of 34.82 lacs and above that at 7900 with OI of 37.36 lacs. Day Range as per Option Table is 7688 - 7830 and as per VIX is 7694 - 7831 with 7756 as the Pivot. Mahurat day say strong open above 7800 and stayed within a narrow range to close positive after many days at 7825.00, gain of 41.65 points. The broader market was also strong, with 1259 advances to 179 declines. The range for the series stays at 7700-8200. 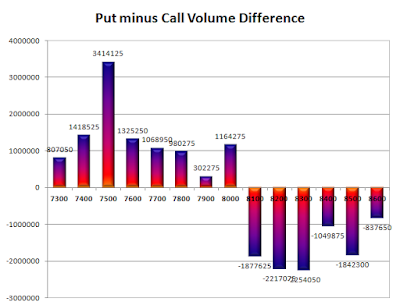 Call option 7900-8100 added huge 11.73 lacs OI with profit booking seen at 8200 and above strike prices. Put option 7800-7700 added 4.98 lacs OI with profit booking seen at 7600 strike price. Nifty Open Interest is at 1,76,33,325 down by 1,04,250, with increase in price, most probably short covering. Bank Nifty Open Interest is at 24,34,920 down by 35,010, with increase in price, most probably short covering. FII’s sold 0.07 lacs Futures, which includes net 211 contracts long liquidation and 85 contracts short build-up, with decrease in net OI by 126 contracts, includes 949 longs to 1245 shorts for the day. FII’s Index future open contract as on date is 158816 Longs to 123952 Shorts, Net Long 34864 down by 296 contracts. 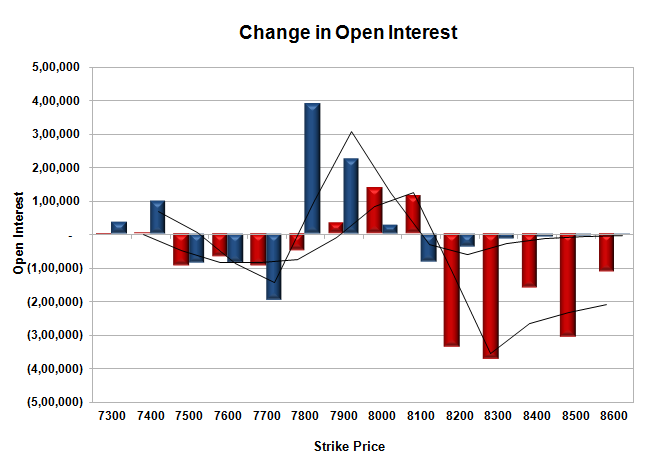 Initial support stays at 7800, with OI of 42.39 lacs and below that at 7700 with OI of 55.42 lacs. 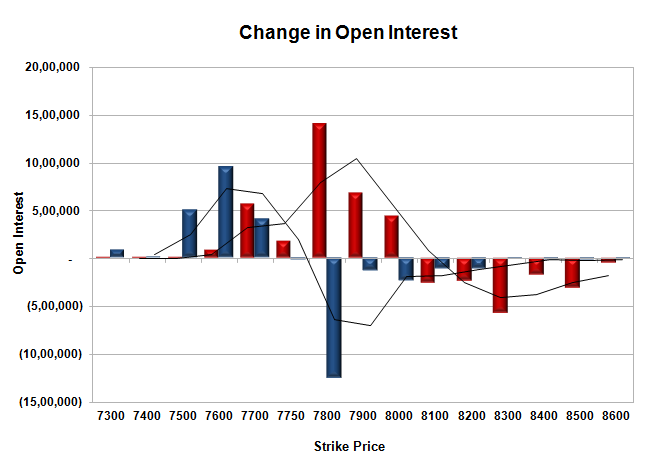 Initial resistance at 7900, with OI of 34.44 lacs and above that at 8000 with OI of 52.87 lacs. 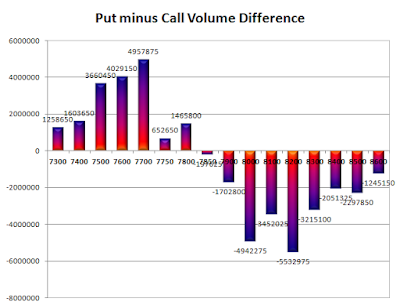 Day Range as per Option Table is 7758 - 7901 and as per VIX is 7756 - 7894 with 7831 as the Pivot. The Index opened weak and saw huge selling pressure from the onset to break one psychological level after another to close near the lows at 7783.35, huge loss of 131.85 points. The broader market was weak, with 493 advances to 1009 declines. The range for the series stays at 7700-8200. 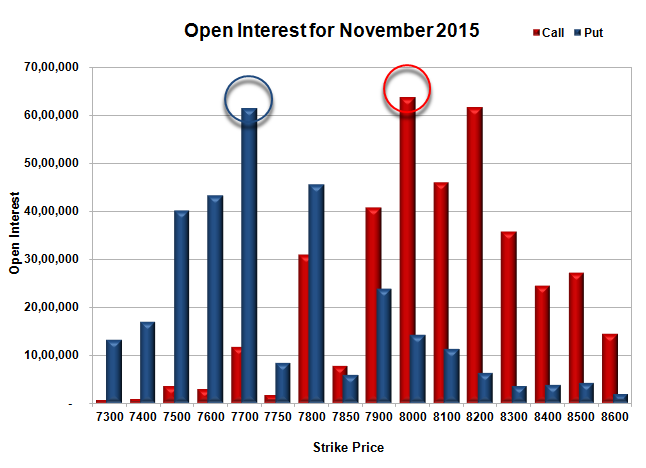 Call option 7600-8300 added huge 57.05 lacs OI with profit booking seen at 8400 and above strike prices. Put option 7700-7300 added huge 22.72 lacs OI with short covering seen at 7800 and above strike prices. Nifty Open Interest is at 1,77,37,575 down by 1,95,000, with decrease in price, most probably huge long liquidation. 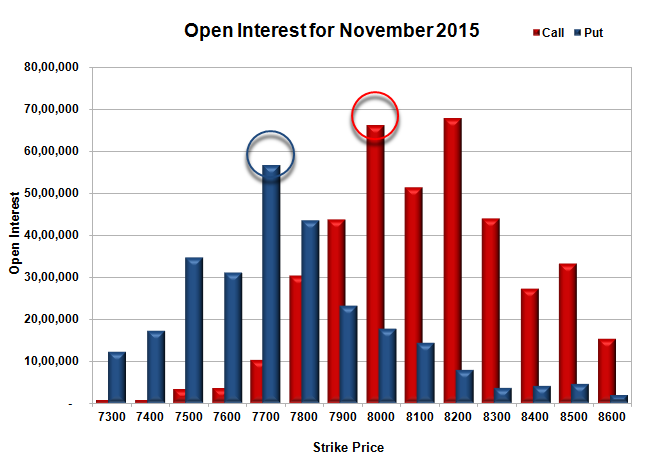 Bank Nifty Open Interest is at 24,69,930 up by 51,150, with decrease in price, most probably short build-up. FII’s sold 4.62 lacs Futures, which includes net 12265 contracts long liquidation and 6196 contracts short build-up, with decrease in net OI by 6069 contracts, includes 31234 longs to 49695 shorts for the day. 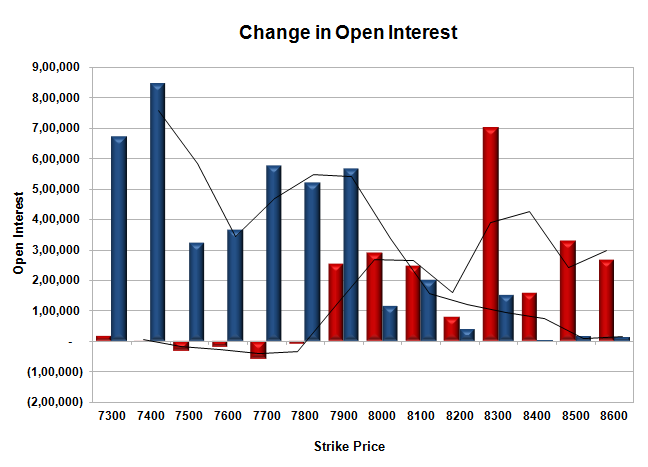 FII’s Index future open contract as on date is 159027 Longs to 123867 Shorts, Net Long 35160 down by 18461 contracts. Initial support at 7800, with OI of 38.96 lacs and below that at 7700 with OI of 53.86 lacs. Initial resistance at 7900, with OI of 32.73 lacs and above that at 8000 with OI of 45.29 lacs. Day Range as per Option Table is 7730 - 7882 and as per VIX is 7715 - 7852 with 7814 as the Pivot.